The Wars of Pooch: Step One, Complete! Napoleonic British Based! 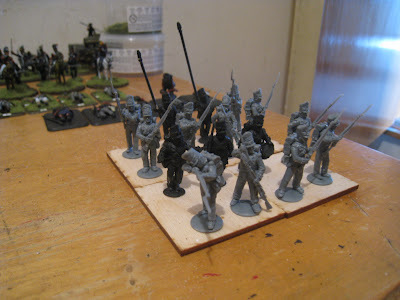 Well, after a week of PVA glue and big paintbrushes, my British Napoleonic Army is based! There is what I have got! 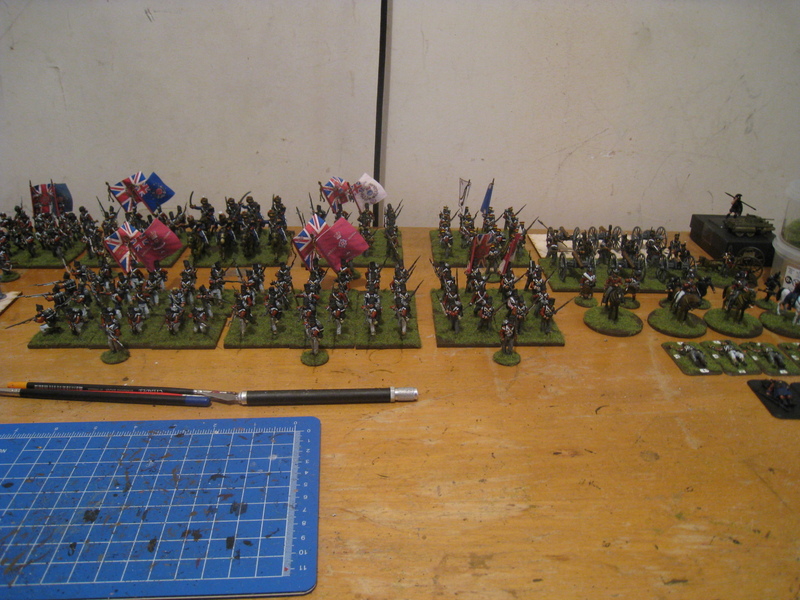 In Lasalle terms: 2 Large Guards Infantry Units, 5 Infantry Units, 1 Hussar Unit, 1 Unit of Artillery, extra skirmisher and sapper stands, 4 commanders and some casualty markers. So what is left to paint for my Napoleonic British? The Duke Himself- because it ain't Waterloo without the Duke! Although I have just noticed one of the front ranks has a particularly... exaggerated pose of his head. I will fix that before I apply some paint! 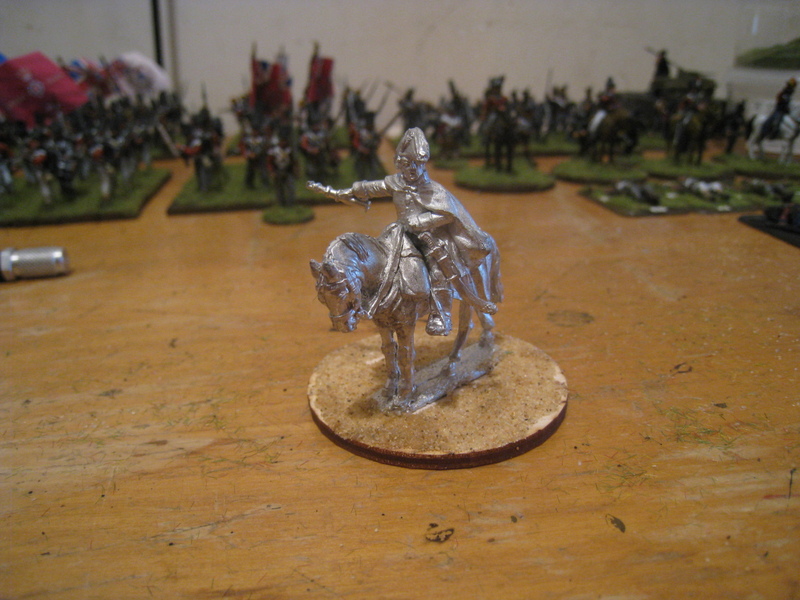 Because it aint Waterloo without him; here is the Duke of Wellington himself, ready to get some paint applied also. But no paint (other than undercoat) can be applied until 11:01 am on the 20th of December (00:01 Canadian Time) so these chaps will have to wait! I still need to assemble the regiment of Landwehr, so that will likely happen in the next day or two as well. Great looking army you have there Chris. Thanks for the kind words! Just hot to get the last few things done, would be great to have a totally finished army! What brand are the guns - I presume they are plastics of some sort? BTW - why a 4th gun stand for the Arty Bty? In Lasalle they are 3 obviously but logically for battalion level games 1 model = 1 section of 2 guns means they'll usually be 3 stands/models also - so do you have some cunning scheme for the 4th stand/model (or an alternate ruleset)? Those guns are the Victrix plastics. The 4th gunner is just an officer with a limber- useable as an objective or in Lasalle terms as a marker to show they are limbered. 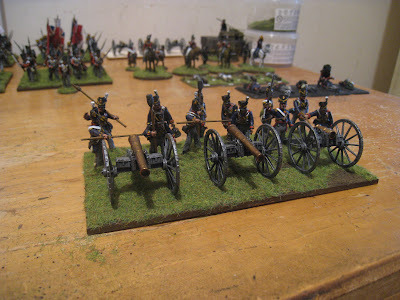 No sneaky cunning plan of getting a 4th gun for the British artillery battery! The artillery are all on one big 150x75mm base- so it is 12 crew per base of 3 guns! The Victrix guns are not bad, annoying to assemble, but I am ok with that for the price. The faces are jokishly awful tho, Victrix does not do faces well in my opinion. I would bring them up, but I have no clue what so ever on how to transport them! Hello! I was surprised in a good way as soon as I opened this web page of your resource. What was the leading aim at that moment when you decided to create a site?